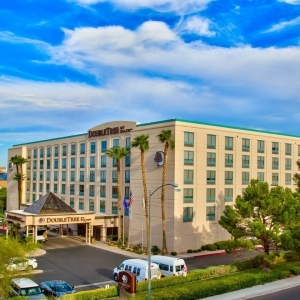 Just two miles from the airport, the DoubleTree by Hilton Hotel is a convenient place to stay if you want to avoid the Strip and still enjoy the excitement of the bright lights and all the other fun Las Vegas has to offer. Take advantage of the complimentary 24hour shuttle service to and from the airport and also for your convenience you can schedule to and from trips to the Tropicana until 11:00p.m. At the DoubleTree you will have access to the fully equipped fitness center, free internet and a heated outdoor pool.